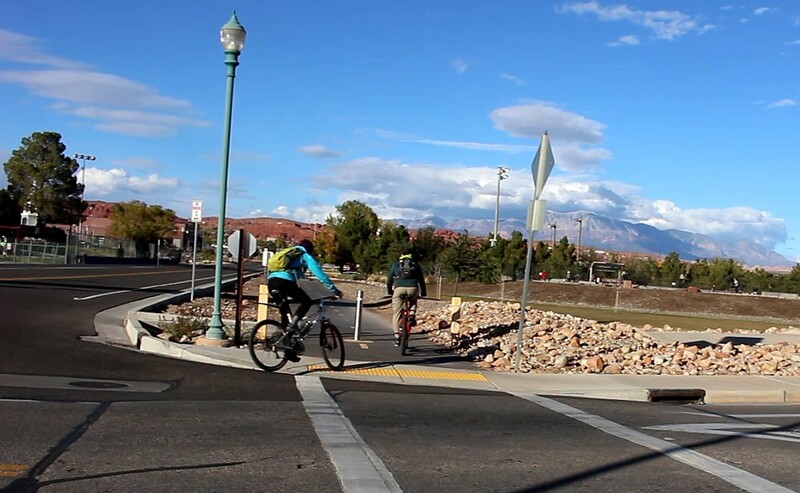 ST. GEORGE – With active transportation gaining popularity in Southern Utah in recent years, the St. George City Council authorized the creation of an active transportation plan last year. The plan would access the needs of active transportation, which typically involves travel by foot or bicycle, and make city infrastructure and policy recommendations to accommodate and promote it. Council members and other city officials were presented with draft copies of the plan Thursday. According to data presented in the draft plan, 40 percent of the city’s population, or just over 30,000, of the city’s 70,000 residents are under the age of 16 or over 70. These individuals are either unable or less likely to drive, leaving the potential for them walking and bicycling. Around 40 percent of all trips within St. George are under 2 miles. Over 93 percent of overall trips in the city are done by car. The remainder are done on foot or by bike. St. George currently has 150 miles of combined bike paths, paved trails, unpaved trails, shared roadways and so forth crisscrossing the city. The draft plan, which identifies 300 potential projects, would increase that to a combined 344.5 miles. “We looked at every single project, every single street, almost every inch of every street – everything,” said Marc Mortensen, support services director for the city and a member of its active transportation committee. 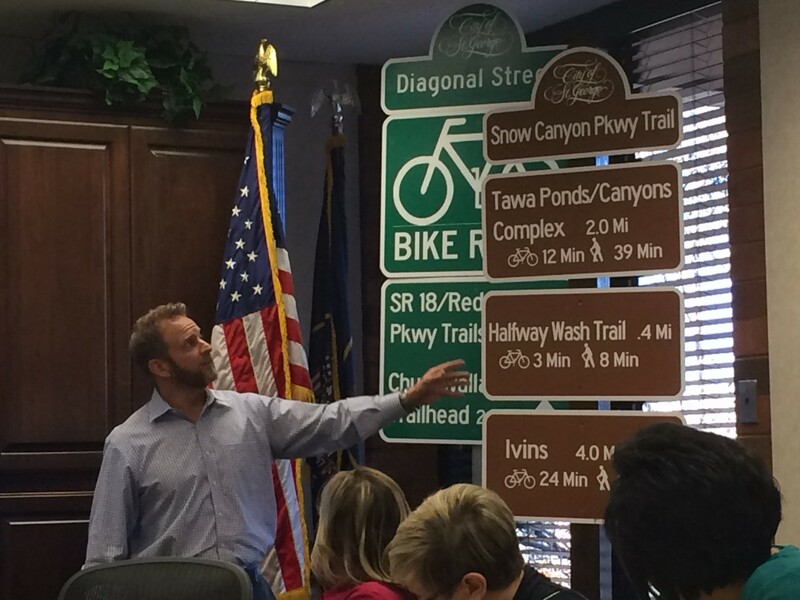 A goal of the plan is to create and supply interconnectivity between the city’s trail system and streets in order to make it easier for walkers and cyclists to reach their destinations, Mortensen said. “(This) includes shopping centers, institutes of higher learning, obviously to work, (to buy) groceries as well as going to parks and some of the recreational facilities,” he said. Another reason for the plan is to provide residents with a few more options in how they choose to travel. They can choose to walk, ride a bike, take their car or take the bus. “We want people to have the choice,” Mortensen said. The plan also proposes ways to promote and improve safety between cyclists and motorists. St. George and Washington County overall have become known as a mecca for runners and cyclists. Athletic events like the St. George Marathon, Ironman competitions and others contribute to this recognition. 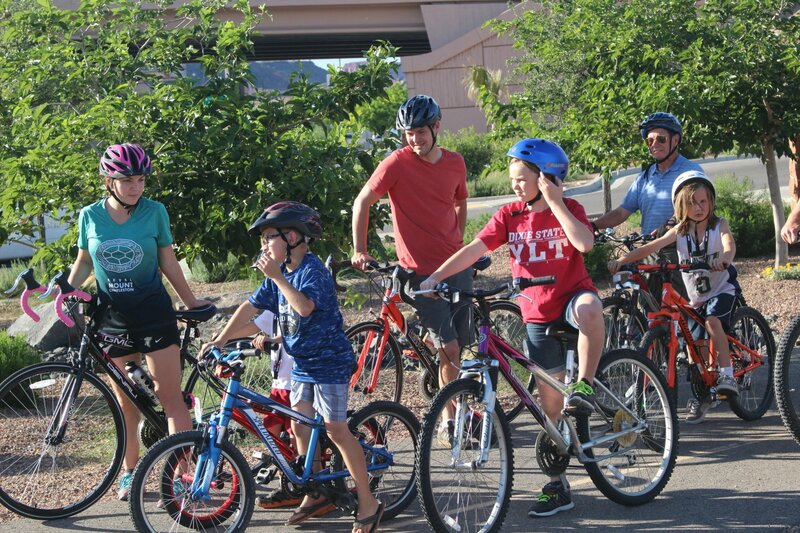 St. George and neighboring cities have also earned the “Road Respect” designation that promotes safety for cars and bikes through a cyclists-friendly infrastructure, among other things. The designation is sponsored by a number of agencies, organizations and programs, including Utah Department of Transportation, Department of Public Safety including Utah Highway Patrol, the “Zero Fatalities” campaign and Bike Utah. Hurricane, Washington, Santa Clara, Ivins, St. George and Springdale as well as Washington County overall are now Road Respect communities. The reasons people choose to engage in active transportation typically include personal transportation, fitness and recreation. “The whole premise behind active transportation, and why we’re involved, is it creates healthy people, it creates a healthy environment, it creates a healthy economy and it creates an opportunity for mobility for everyone — every demographic in our community,” Mortensen said previously when approval was given to create the plan. In order to best gauge what the community wanted out of an active transportation plan, planners sought public input from attendees at the 2016 Dixie Transportation Expo and also through an online survey that garnered 600 respondents. Around 65 percent of respondents wanted more paths, trails and so on in the city, said Tom Millar, of Atla Planning and Design, a consulting firm specializing in active transportation planning that helped draft the city’s proposed plan. Another take away from the survey was that respondents want a network of street facilities that would help connect cyclists to their destinations. Respondents were asked what may keep them from engaging in active transportation. Survey results showed worries over items related to vehicle traffic and drivers, Millar said. The plan is more than a collection of active transportation projects, Mortensen said. It also gives recommendations for policies and standards the city can adopt in order to promote active transportation. They include methods of public outreach and education about the benefits of leaving the car at home in favor of your feet or a bicycle. “I think active transportation is successful when people start to look at their shoes and their bikes as transportation,” Mortensen said. The draft was met with general favor by the City Council, though they did not vote to approve it at the time. After a period of additional review, the council will vote on the plan in a forthcoming council meeting. “I think it’s really got great concept and great recommendations,” Mayor Jon Pike said of the proposed plan. You need not try to make yourself look lazy and stupid. It’s already out there, clear as day, for all of us to see. I agree with your comment. you need not try to make yourself look lazy and stupid.it’s already out there. clear as day and we can all see it ! you said it ! Aww. you poor little thing did I hit a nerve ! The love you two have for each other is remarkable! It’s sooooo cute. And now you’ve added Bob so you are like the 3 stooges. The SUBA folks seem to have a generally good perspective on future needs. My only concern is that we could likely improve the safety of existing “Bike Lanes” which share the road with cars/trucks, with some shoulder improvements, without going as far as creating a separate bike pathway. 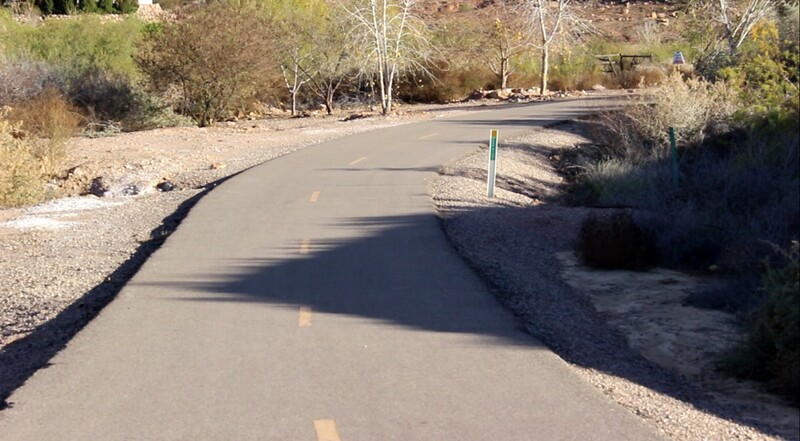 In certain stretches, such as Dixie Drive above Cottonwood Cove Park, there is not much real estate left to create a better bike-friendly shoulder, so an alternative pathway is justified. I really like the trail system. I’d like to see the county continue it up Highway 18 to Pine Valley. It gets used very frequently, and having it continue north on the marathon / ironman route makes sense. Oklahoma Cheetos are the worst LOL !